Why Is Treating Decayed Baby Teeth Important? Baby teeth guide the development and position of adult teeth as a child gets older. If they get large cavities and come out too soon, it can harm the health of those adult teeth and have long-term consequences. Although baby teeth are eventually lost, they still need to function for many years. If they aren’t healthy it can cause problems with the child’s speech and ability to chew. A cavity is really just a type of infection, whether it starts in a baby tooth or a permanent one. If left unchecked it can lead to an abscess and spread to larger areas where it can cause bigger problems. How Are Cavities In the Baby Teeth Treated? Cavities in children are treated much the same way they are for adults. In the case of small cavities, a dentist will start by removing the decayed tooth structure before placing tooth colored fillings in Castle Rock. If a cavity is larger and has destroyed more of the tooth structure, a crown may be necessary to restore the tooth’s size, strength and shape. This way, it can function normally for several more years until it naturally sheds on its own to make way for the permanent tooth. 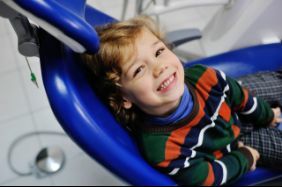 A pediatric dentist will make your child’s comfort a priority throughout their appointment. Many children do well with nitrous oxide, also known as “laughing gas”, which is breathed through a comfortable nosepiece (referred to as a “bunny nose”). This calms and relaxes them before the area is numbed with local anesthesia. 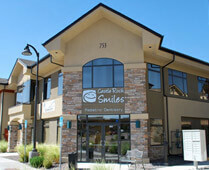 Then the procedure is done quickly and efficiently to minimize the amount of time spent in the dental chair. If your child needs more than one filling, a dentist will do as many as they can comfortably tolerate in one appointment. The goal is to go at your child’s pace and make sure they’re comfortable at every visit. By removing tooth decay and making sure your child’s baby teeth are healthy, you’ll be making sure they maintain great oral health and have a happy, healthy smile for many years to come! 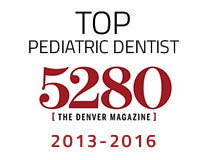 Dr. Layne Benzley is not only an award-winning pediatric dentist in Castle Rock, but also a father of four. He wants to make sure that parents are well-informed about the importance of healthy teeth at every stage of their child’s development and always takes the time to answer any questions they may have. If you’d like more information about treating childhood cavities, he can be reached via his website or at (303) 660-5373.